New employees, whether on site or remote, need to undergo a formal onboarding program. With the advent of instant communications via the Internet – whether through chat or video conferencing, more and more companies are opting to hire virtual employees. When you work for a company that has a large international presence, chances are you will work with colleagues in different locations. 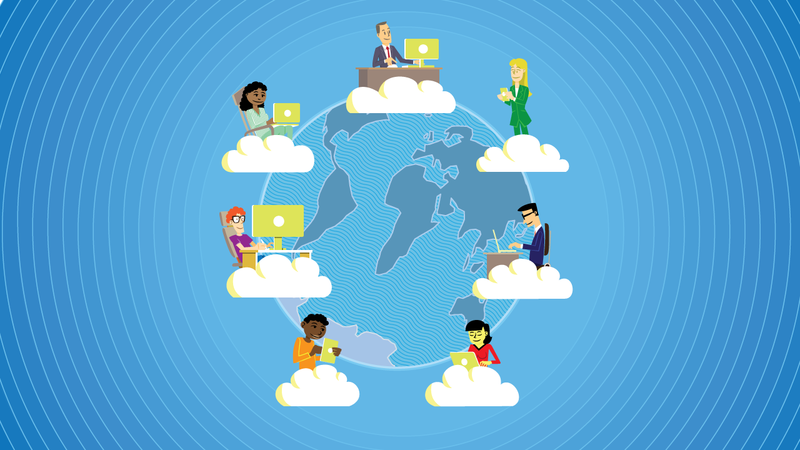 Many companies struggle to onboard and maintain momentum with remote employees. Employers also find that virtual employees experience less job satisfaction compared to local employees who are more engaged. Companies are missing a successful onboarding program that will improve employee retention and help personally link virtual employees to the office. By providing tools and communication to ensure accountability and engagement, the process of bringing in a new hire will come much easier. A well-designed onboarding process will ensure that new employees are immediately engaged in their work and feel comfortable while entering their new place of employment. New hires are usually welcomed in person, making it easier to answer their questions, introduce them to team members, and notice their reactions. However, virtual employees are often left out of that process. They attend orientation through phone calls or video chat, rarely meeting their team members face-to-face, and often experience work and company culture very differently. Successful onboarding programs create a connection between employees increasing satisfaction and the goals of the organization. The first step in onboarding virtual employees is to create an onboarding project to ensure all virtual employees are trained and up-to-speed. Here are some best practices to help remote workers get started. It is essential for an employee to connect the face to a voice to be able to build a strong relationship. Using video conferencing is a great way to welcome remote employees to the company. It allows new employees to feel comfortable to ask questions and strengthens personal bonds. The use of video conferencing includes eye contact, observing body language and learning more about the person you are meeting, without the stress associated with travel. Redbooth allows for real-time communication with the use of HD video meetings, screen sharing and work chat. It is a great way to include virtual employees in meetings and to make sure they have a voice without being physically present. In a typical office environment, it’s easy to forget about employees working remotely. The comfort of walking around the office and interacting with one another is something virtual employees are unable to experience. The key to a successful work environment is allowing new hires to experience the office regardless of where they are located. Take new hires on a virtual tour of the office in the comfort of their seats. Virtually walk them through the office, introducing various team members. Have co-workers welcome them to make them feel like they are also part of the family. This prevents new hires from feeling isolated and uninvolved. It is important to enable real time communication via chats and instant messages. This allows for remote employees to communicate with colleagues immediately, and help with the adjusting process of familiarizing new hires with their new role. Redbooth includes a great way to discuss potential projects and ideas, and share information. These conversations are easily turned into a task, making it easier to remember what must be done. When onboarding a virtual employee, it’s easy to get distracted and lose track of what must be done. It’s essential to be extremely organized and have detailed outlines of everything you need done from your new employee. A good way to do this is with a shared document. Have one main document with an outline linking to several different related documents. Another good way is creating a task list with precise due dates. Creating a task list ensures that each employee is assigned to a specific task, and projects are completed on time. This reduces any confusion in the office and for employees who work from home. Redbooth is great for creating task lists and linking to other relevant tasks, documents, notes and conversations. To save time, it’s very easy to use task list templates, which allow managers to create the same onboarding task list each time a new remote worker starts at the company. If you are onboarding a virtual employee with many responsibilities, break them up into different parts and introduce them in steps. Confusion and misunderstanding can interrupt workflow, but with organization and clear instructions, employees will know exactly what is expected from them. In a traditional office environment, employees often attend classes or participate in on-the-job training, which is impractical with remote workers. Breaking up the content into building blocks that are taught in chunks is an effective learning process. Make sure an employee fully understands what is expected from them before moving on to the next step. When responsibilities are introduced gradually, they can be mastered more quickly, resulting in more efficiency and productivity. Virtual employees rarely step foot in the corporate office, making it easy to forget about company culture. Culture is just as important in onboarding as day-to-day responsibilities. As a company expands and starts to hire remote employees, they often find their culture unable to evolve in the process. Onboarding remote workers in terms of culture can be done through coaching, mentoring, and technology. Pairing remote employees with an “on-site” team member is the best practice to opening the lines of communication. Team members can ensure that virtual employees are well aware of the workflow, organizational values, business goals and performance expectations. Let remote employees know that they are free to communicate and ask questions whenever they feel the need to. When employees feel connected to the culture, they are more willing to work harder and feel as though they are making an impact. It’s easy to neglect the effectiveness of the program once it’s implemented. By regularly collecting feedback from remote new hires, you can improve and adjust to program to ensure that they have a good start at your company. Once virtual employees have been on the job for a while, get in touch with them and review any concerns they may have. With technology today, there is no reason for remote employees to feel unwelcomed by the organization. It’s vital to make their first encounters with the company positive and memorable, even if they are miles away. What was the best or worst experience you had when trying to onboard a new hire?